Cindy’s interest in the field of Physical Therapy began in high school after a knee injury, which required rehabilitation. 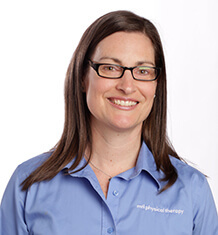 Cindy began practicing Physical Therapy in 2000, after graduating from Grand Valley State University in Michigan. Her love of the outdoors and the opportunity to work for MTI Physical Therapy brought her to Seattle in 2008. In Seattle, she pursued advanced training in Manual Physical Therapy and completed the Residency, Fellowship and PhD programs through the Ola Grimsby Institute (OGI). She became a Fellow of the American Academy of Orthopedic Manual Physical Therapists in 2010, and has been a certified Orthopedic Clinical Specialist through the American Physical Therapy Association since 2006. She is currently working at MTI’s Magnolia location and is Co-Manager of the clinic. Cindy enjoys treating patients with all types of diagnoses, but due to her own neck issues over the past few years, she has a special interest in those currently experiencing neck pain and dysfunction. She has seen first-hand how a combination of skilled manual therapy and specific exercise training has allowed her to participate in recreational activities again without pain. Cindy has been teaching weekend courses for the OGI since 2015, and is a clinical instructor and mentor to residency and fellowship students. In her free time, Cindy enjoys backpacking, hiking, skiing, running, kayaking and traveling to new places.